In a previous post, I described what coaching is, how to coach your own people and how coaching can even be useful to those that don’t manage others. Here, I expand on this introduction, explaining how coaching benefits the organisation, the manager and staff member. Most people yearn to do a good job and to release their full potential in the workplace. Working in an environment where their manager supports them in this and helps them to find their motivation creates a “win/ win” for leaders and those they lead. A coaching approach can help people to be more effective and so gain more satisfaction from their work. The results of this can bring huge benefits for their development. The coachee can take more responsibility, become more committed and productive in a supportive, empowering and stretching environment. It is also a useful mechanism for job enrichment, as you can use the unsung heroes in departments who may feel they have reached a plateau, but who will have significant experience and organisational knowledge. People at work can often feel like a very small inanimate cog in a very large machine. Using a coaching approach absolutely turns this on its head. Any intervention using a coaching approach, from a ‘corridor conversation’ to an annual appraisal, means that the ‘coachee‘ is the focus of attention and the most important person at that moment for the manager. I think coaching has perhaps the greatest impact because it challenges the individual to implement changes in their work and follows up if this has been done and what it has achieved. It is therefore far more likely that individuals make the required changes to their practice/work. It is also more likely to make a positive impact on work because it is more supportive and is an individual approach. Changes are gradually introduced that support the individual to achieve the desired outcome in an appropriate time and way specific to that individual. It also encourages a “learning” response in people who then go on to be self coaching i.e. asking themselves the sorts of questions a coach would without actually having a coach. A coaching management style is so helpful for the manager in that it will take away the pressure and stress of having to come up with all the answers themselves. For example in one major plc, field staff were not getting any 121 support because the managers felt that they personally had to come up with all the solutions to the problems. Now they act as facilitators and help their staff to come up with 2 or 3 solutions – if it comes from within a person there is every chance they will do it. However much of UK plc still believes that managers must tell! I’ve never come across an organisation in which managers complain of having too many excellent staff. Since the performance of a team or organisation will always reflect many different individual inputs it helps to get the best out of every member of the team. A coaching style can make a real contribution here. It is most rewarding seeing line reports blossom using such an approach. One of the benefits from organisation-wide coaching is that it improves knowledge transfer, or if you like, gets the stuff to move around the organisation better. People learn that their knowledge and skill-set is valued more when it is made widely available than when it is wrapped around them for protection. So it reduces the number of single-holder knowledge/power points. The climate in a business where coaching is a preferred approach creates engagement, improves morale and serves the customer better. This directly impacts the bottom line. In other words the return on investment is high. 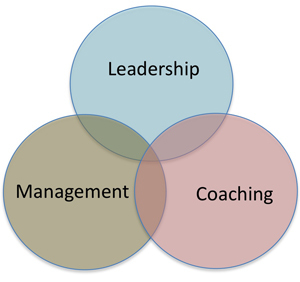 In summary coaching is a very powerful management tool with a number of benefits at many levels. It is also a key leadership style as the old ‘command and control’ is really limited to crisis occasions. Who can you start coaching? What benefits will it bring your business? If you want to get in touch, please email, tweet, or leave a comment below.